The search for a kayaker believed to have gone missing after being urged not to go out to sea in squally conditions has been stepped down. An off-duty police officer, who is also a member of RNLI Mallaig, warned the man before he set off on Wednesday from Traigh near Arisaig. 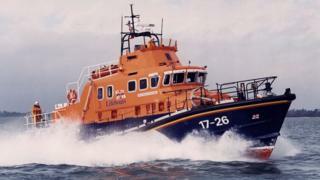 Mallaig lifeboat was launched after the man, in his 30s, failed to return to his parked car. The search was formally stood down on Thursday evening. No further details regarding his identity have been released. Angus MacIver, duty controller for the UK Coastguard, said: "Following a comprehensive search effort in the area with nothing found, a decision has been taken to terminate the search pending any further information." A coastguard helicopter, coastguard officers from Mallaig and Salen and police search dogs were also involved in the search. Stornoway Coastguard had earlier said the kayaker had been encouraged by the police officer not to head out to sea. A coastguard spokeswoman said: "Being a member of the lifeboat crew he knew the conditions. Though the sea was generally calm, the squalls were a problem. "When the officer returned he saw that the kayaker had gone. His car is still there this morning. We are obviously concerned." The search for the man, who has a red kayak, involved coastguard rescue teams from Mallaig, Salen and Fort William, Stornoway Coastguard helicopter, Mallaig lifeboat and police search dogs.